Data users should note that oxygen saturation values in the range 100-110% were recorded in the near-surface water (approximately top 50-60 metres) for the majority of casts on this cruise. The salinity samples from the CTD were analysed during the cruise using a Guildline Autosal model 8400B. Dissolved oxygen concentrations were determined using a Winkler titration technique. The following information contains extracts from the D379 cruise report. 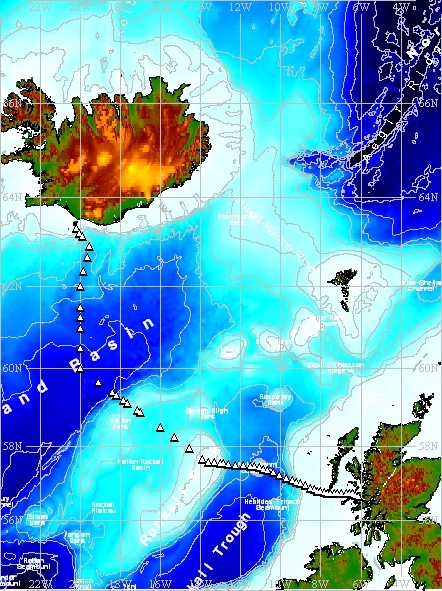 A total of 109 CTD casts were performed during the cruise which sailed between Southampton on the south coast of England and Reykjavík in Iceland, incorporating the Extended Ellett Line and Wyville Thomson Ridge area. All casts deployed during the cruise were housed in a stainless steel frame equipped with dual temperature and conductivity sensors. The CTDs were located within and near the bottom of the rosette frame which held 24 10-litre Niskin water sampling bottles. Following the completion of each CTD cast the data were saved to the deck unit PC and transferred over the network to a Unix data disk. Seabird Data Processing version 7.21f (part of the Seasoft-Win32 suite) was used to perform all CTD processing steps. Raw data files were converted to engineering units and binary .CNV files using the DATCNV program. Sea-Bird bottle data files (.BTL), with information on pressure and other readings logged at the time of bottle firing, were also generated during the data conversion process. The WILDEDIT program was run to remove any large pressure spikes and then the SeaSoft program ALIGNCTD was run to advance the oxygen measurements by 5 seconds ensuring the calculations of dissolved oxygen concentration are made using measurements from the same parcel of water. CELLTM was run, according to Sea-Bird's recommendations, to remove conductivity cell thermal mass effects from the measured conductivity and FILTER was run on the pressure and depth channels using a low-pass filter value of 0.2 to smooth the rapidly changing data. Finally, twin salinities, twin density and depth were calculated using the DERIVE program and TRANSLATE wrote the data to an ASCII output .CNV file. Despiking of the pressure, oxygen, temperature and salinity data was carried out by visualising the data in MATLAB. If a spike occurs in pressure, temperature or salinity the whole corresponding scan is deleted. If the spike occurs in the other channels, the value is set to NaN and all remaining channels are left unedited. Following despiking of the data in MATLAB the module BINAVERAGE averaged the 24 Hz data into 2db-bins, using the downcast data only. Throughout the cruise the CTD was sampled for salinity measurements in order to calibrate the conductivity sensors. Salinity was measured using a Guildline Autosal8400 (#60839) in a temperature controlled room. All CTD data used for calibration purposes comes from the bottle files created by the Seabird software. The Autosal was standardised at the start of every run and a standard seawater analysed at the end of every crate. Each crate contained 24 bottles. If more than one crate was analysed during a run then a standard seawater sample was measured between the crates, but the Autosal was not re-standardised. A total of 282 salinity samples were collected and analysed, including a few duplicate samples. Nine outliers were removed from the dataset. Eight of those appeared to be due to an error in operating the Autosal machine, whilst the remaining outlier came from a sampling or log error. The Autosal and Seabird values were in very good agreement with one another. BODC, however, were not provided with the specific salinity calibration applied to the data. Dumont, E., Sherwin, T. (2008). SAMS CTD data processing protocol, Issue 1. Scottish Association for Marine Science. (Scottish Marine Institute, Oban. Internal Report No 257). Data arrived at BODC in a total of 109 ASCII files, WHP (WOCE Hydrographic Program) format. These files contain 2db-bin averaged data including temperature, salinity and dissolved oxygen channels processed to WOCE standards alongside concurrent fluorometer and transmissometer data. BODC were only supplied with one set of salinity and temperature channels on submission of the data. 24 Hz ASCII versions of these data are also available from BODC upon request. These files are held in their original format, but these remain uncalibrated. Calibrated by data originator using discrete water samples from CTD bottles. A unit conversion was applied as part of the BODC transfer process for this parameter. Station IB19S is one of the fixed CTD stations, which together form The Extended Ellett Line. The line lies between Iceland and the Sound of Mull (Scotland) crossing the Iceland Basin and Rockall Trough via the outcrop of Rockall. As part of this initiative, CTD dips, together with associated discrete sampling of the water column, have typically been carried out annually at this station since September 1996.